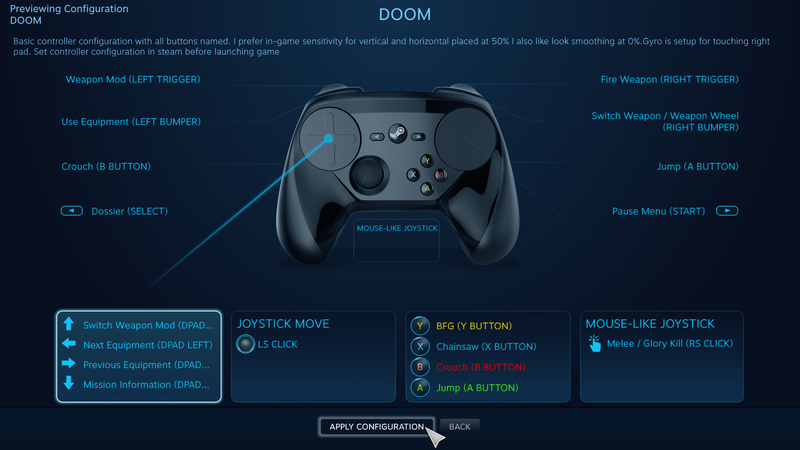 Besides just rebinding your own controls, you can also download and use full input configurations that other players have shared on Steam. We're taken to this screen; on the left you can see a variety of categories. 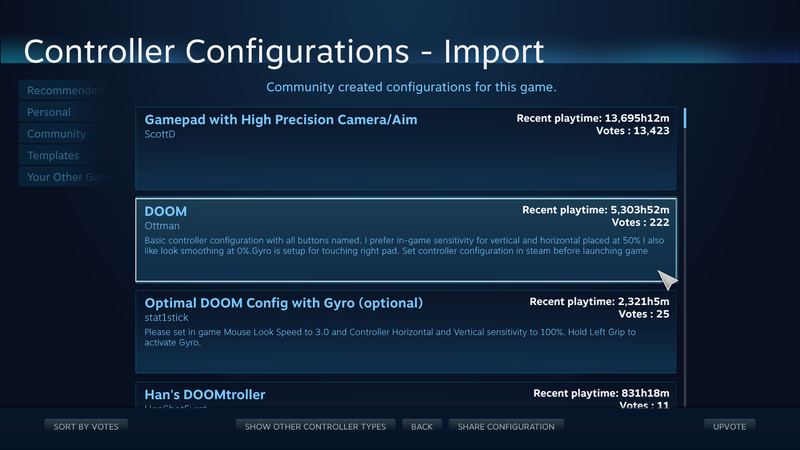 We start with the "recommended" section selected, where id Software (the developer) has posted their official configuration for DOOM. This is the one we currently have selected, which was selected for us by default when we started the game for the first time. 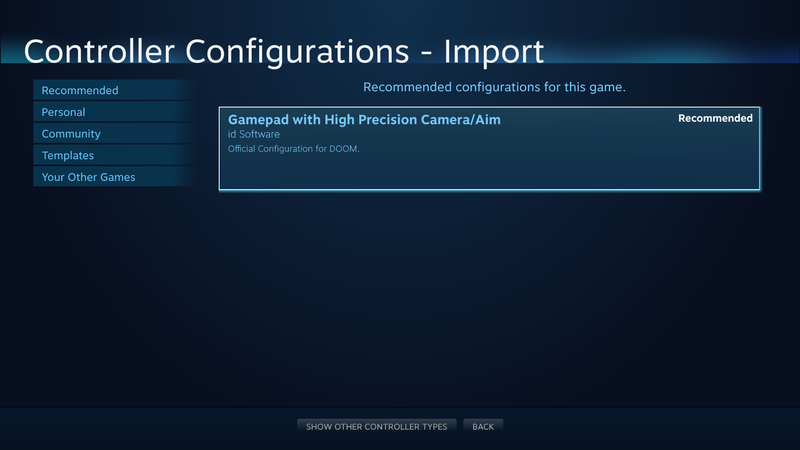 The developer can upload configuration for multiple different controller types -- such as PlayStation 4 controller, Steam Controller, and Xbox 360/One controllers, and on the first run, Steam will detect your device and select the appropriate configuration. 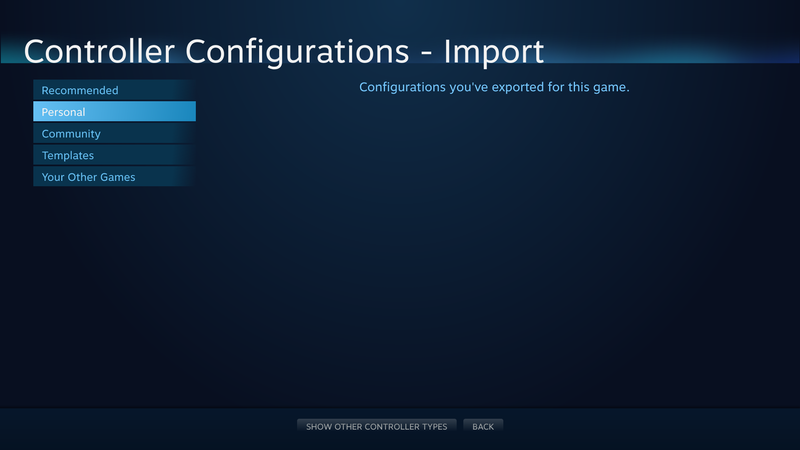 NOTE: By default, all configurations for controller models other than the one you're currently using are hidden, but you can select "Show Other Controller Types" to force them to appear. It generally isn't a good idea to try to use a configuration meant for another physical device, however. 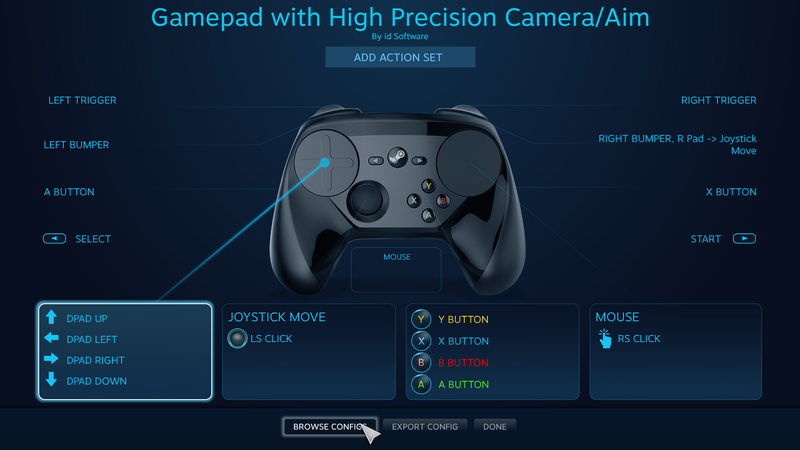 If the developer did their job right, you shouldn't have to do anything to start your game with a well supported controller configuration -- it should all be set up automatically on the first run. Nevertheless, the recommended section should be your first stop to see if the developer has posted any configurations you might be interested in. Certain games might have multiple configurations, such as an alternate control scheme optimized for left-handed (or one-handed) play. This section is currently empty in this example, but anything you export will be saved here. The Community section is where you can find configurations shared by other players. Each configuration will contain a short blurb about its purpose and unique features, as well as stats for playtime and votes. 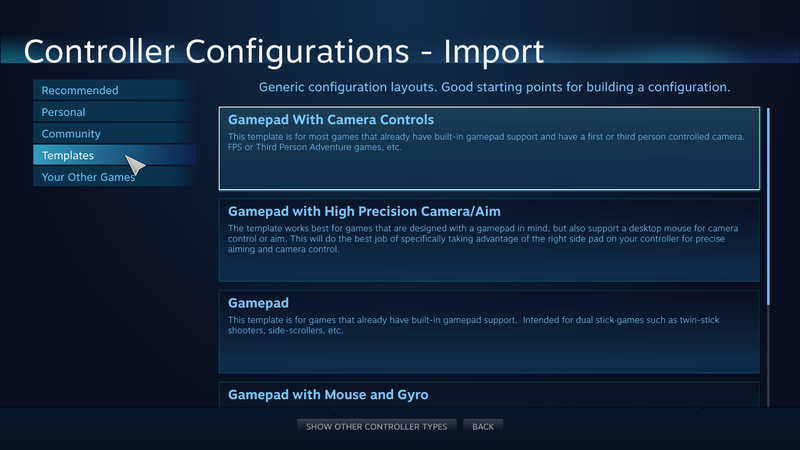 Selecting "APPLY CONFIGURATION" will make this your current config. Sometimes you just won't be happy with a game's official configuration, or you'll want to create your own config but want to skip the tedium of setting up all the basic boilerplate. In this case, head on over to the "Templates" section, which is full of generic input configurations for each controller model, with many variations for all the most common game genres.